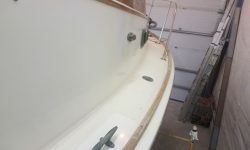 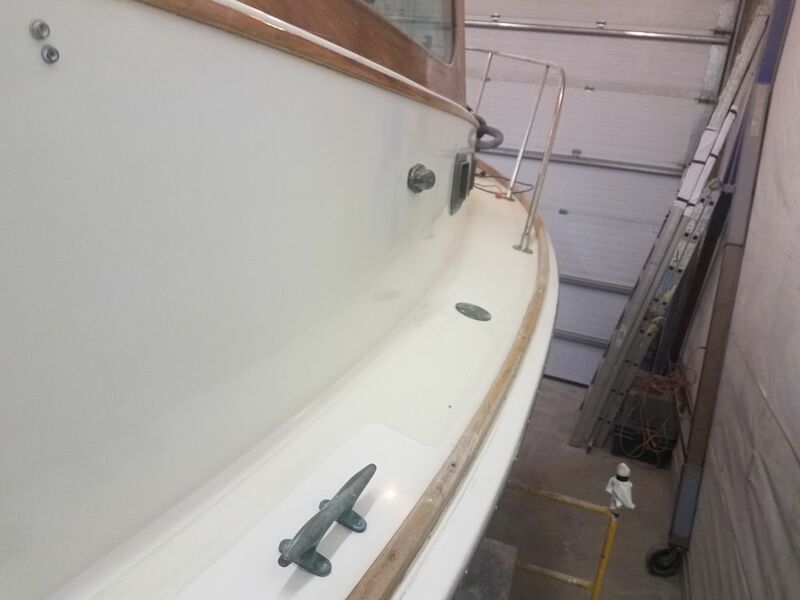 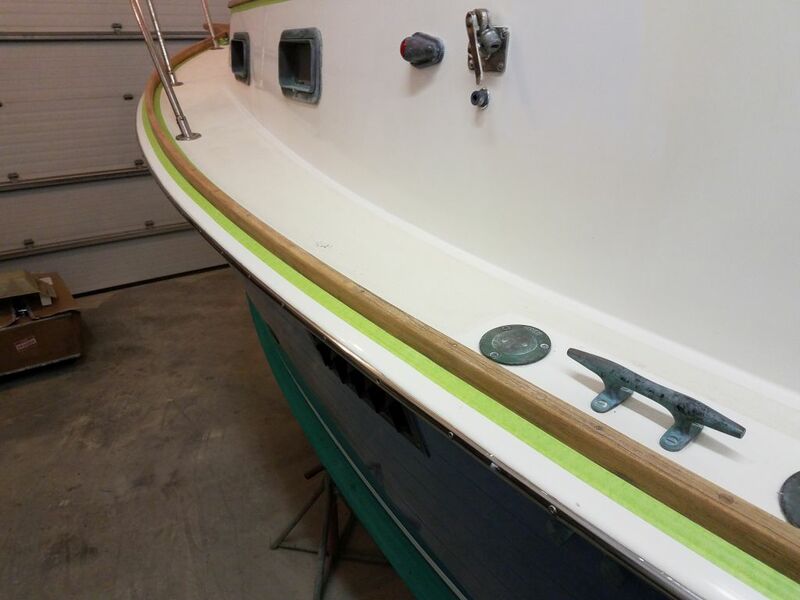 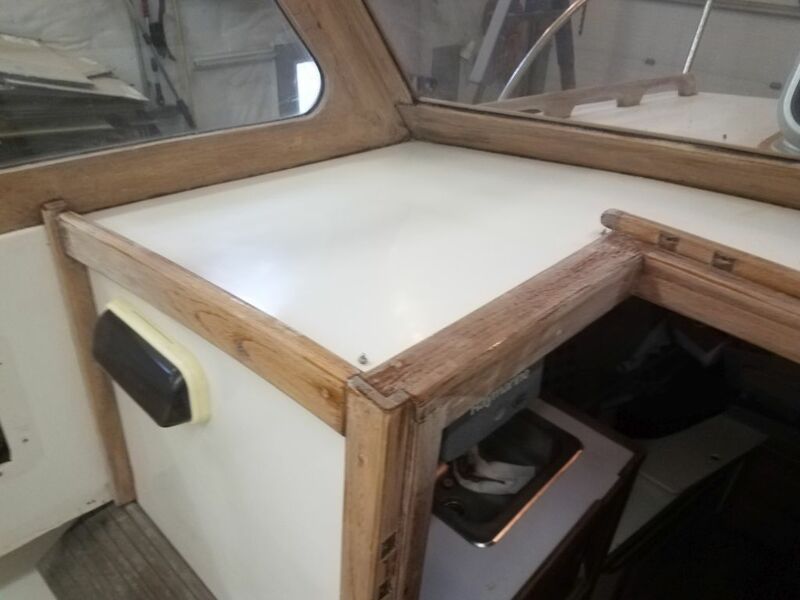 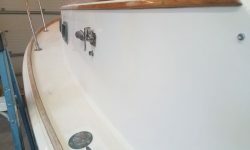 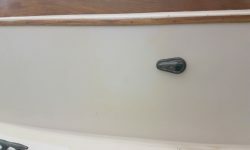 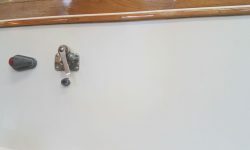 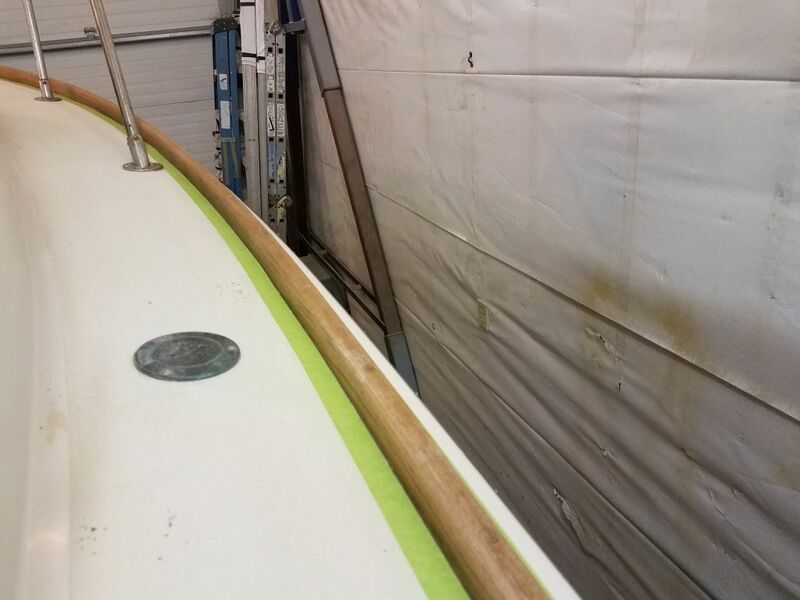 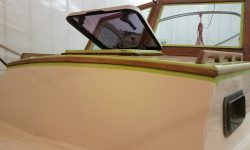 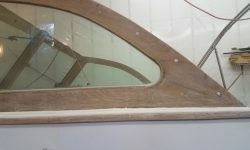 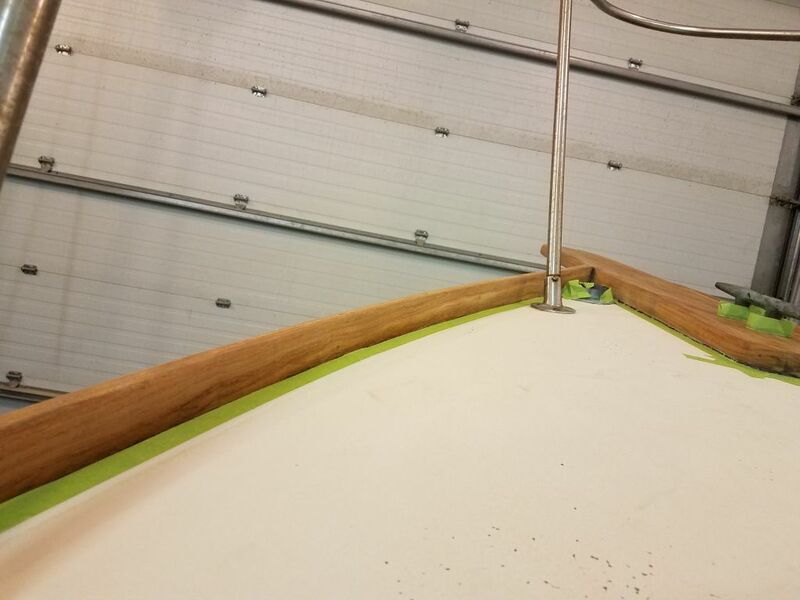 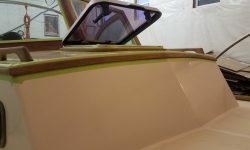 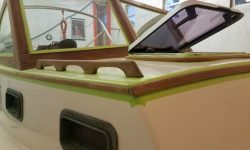 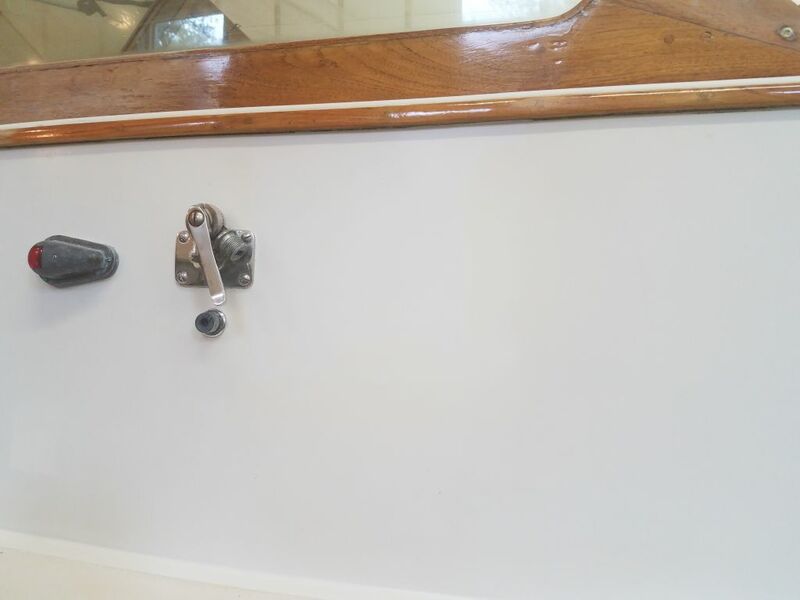 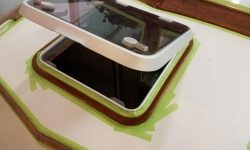 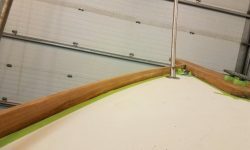 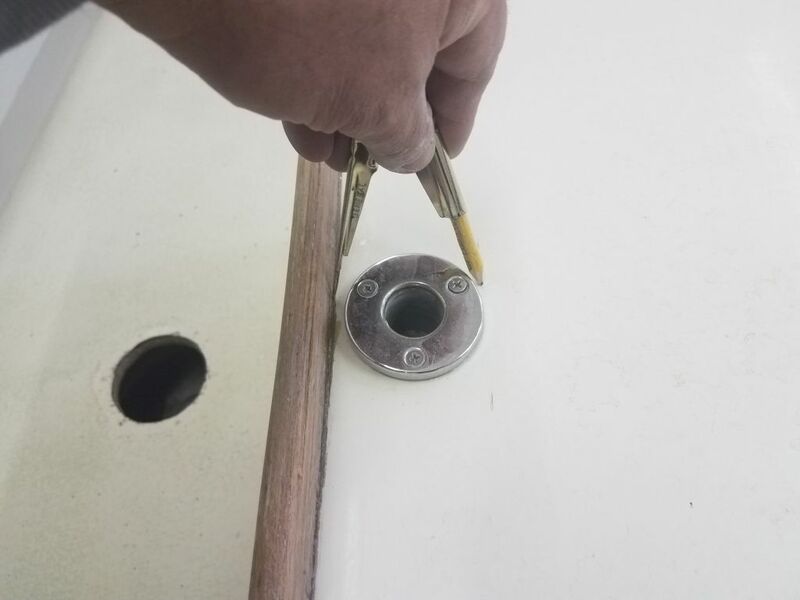 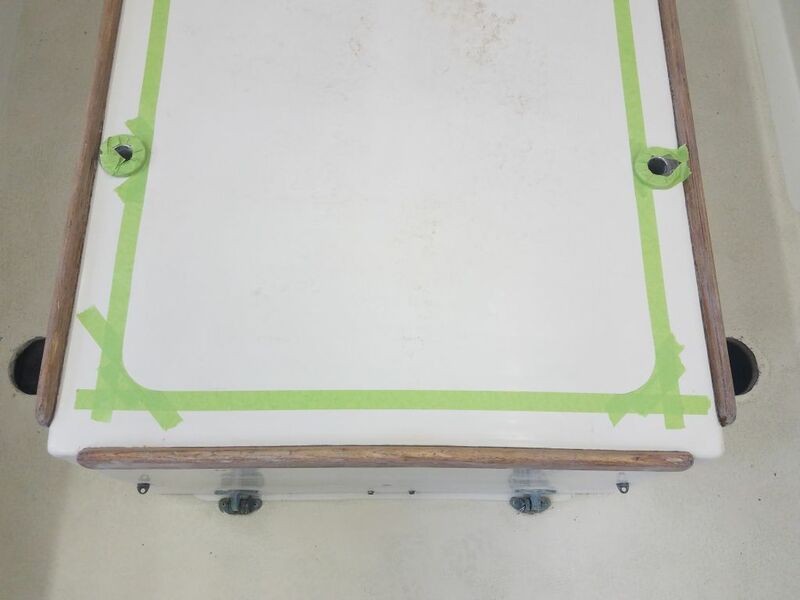 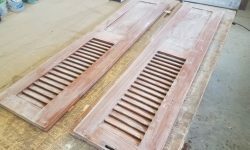 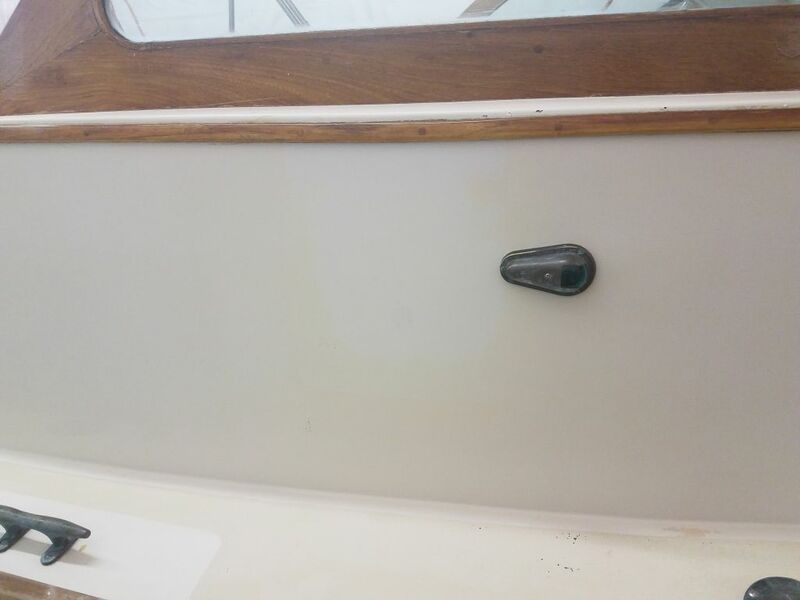 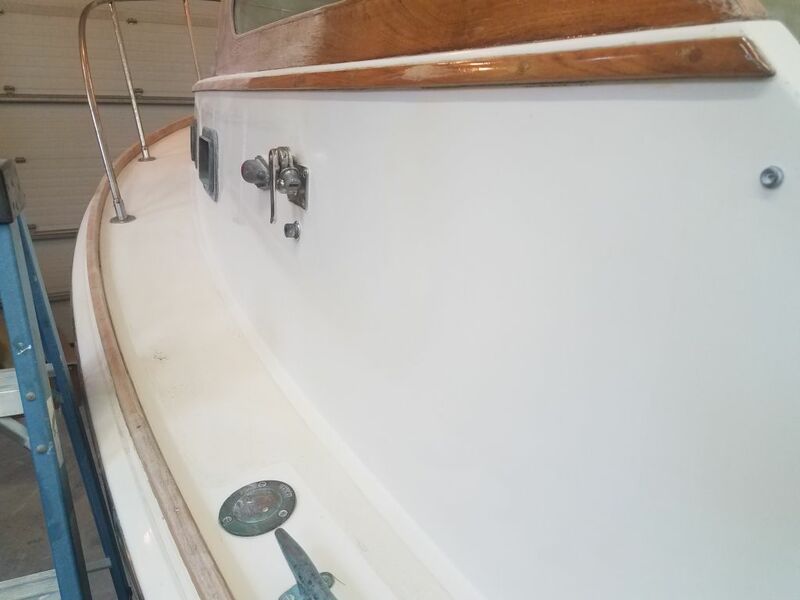 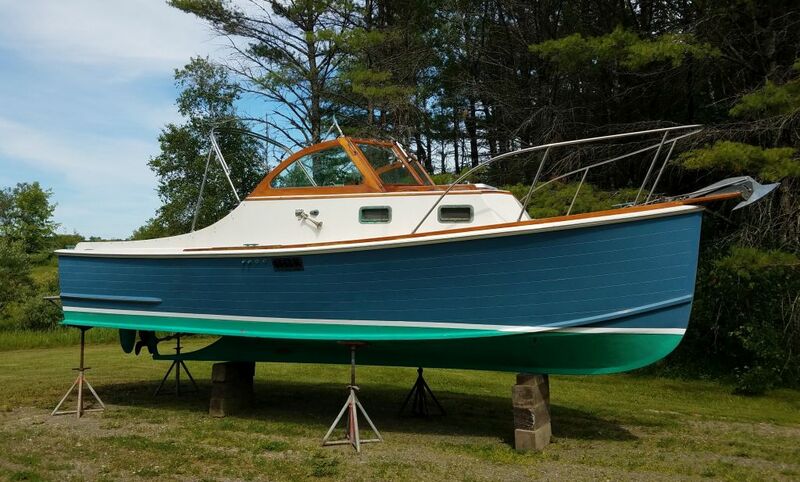 To begin, I wet-sanded and polished the new gelcoat repairs in three areas on the boat, completing this work. 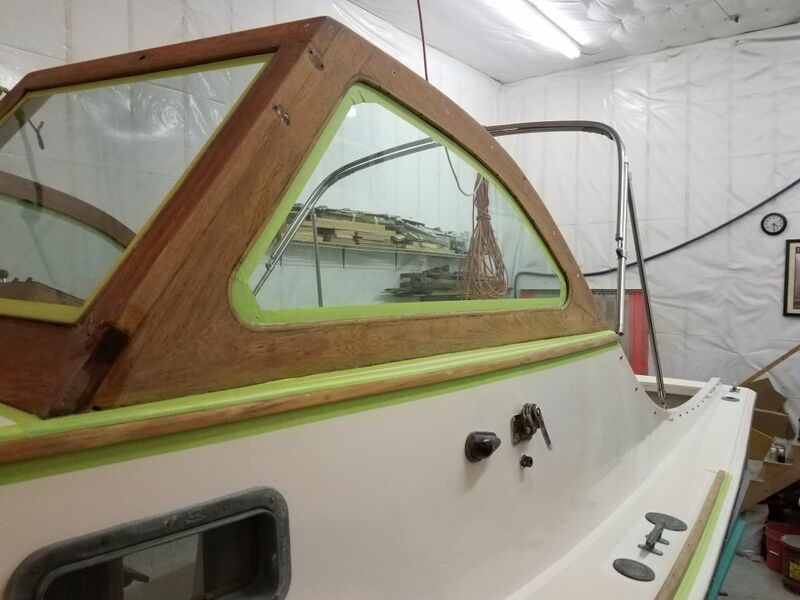 Afterwards, I finished sanding the brightwork in those areas that had been covered and inaccessible while the gelcoat repairs were underway. 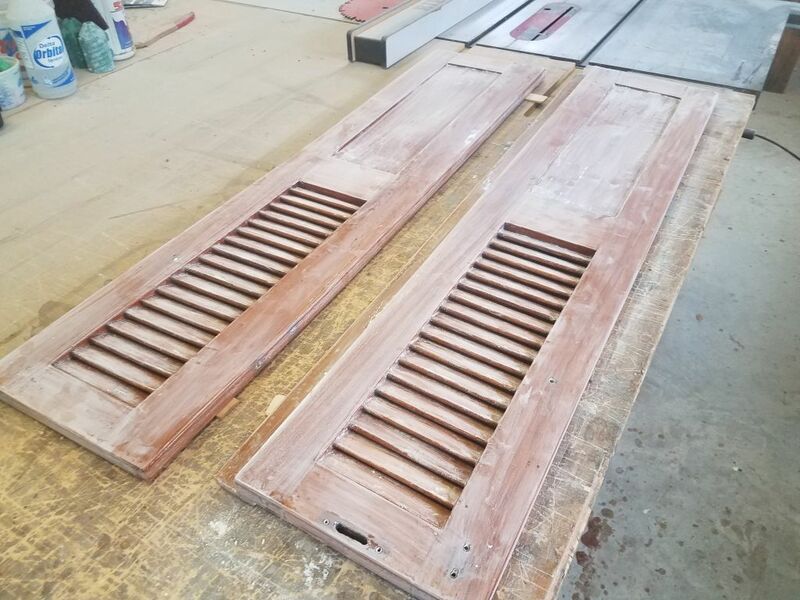 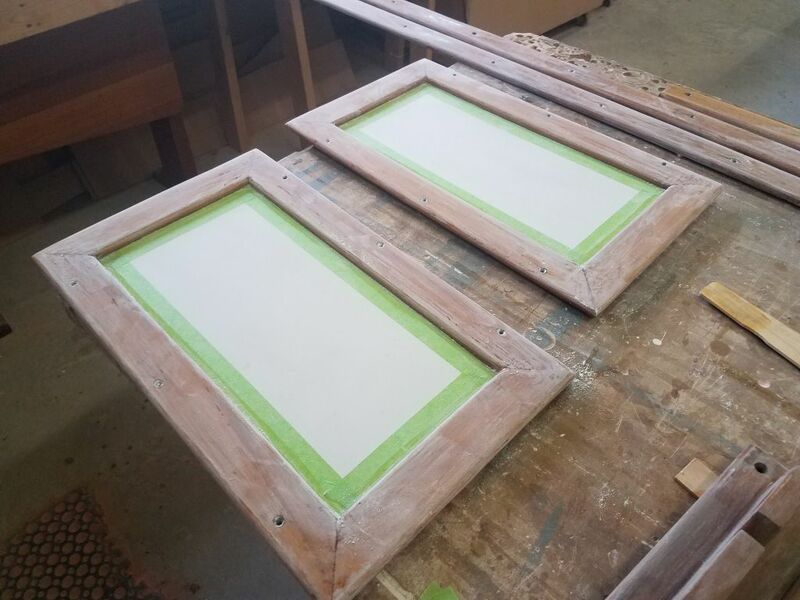 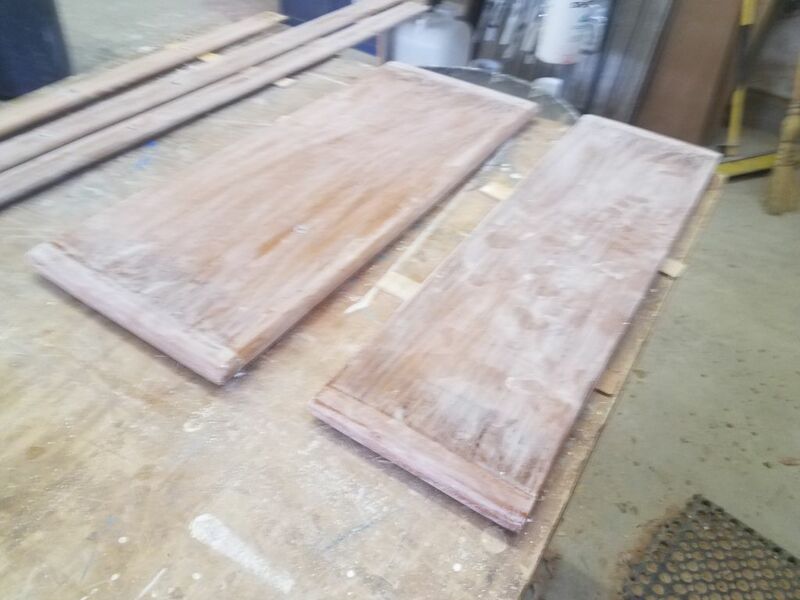 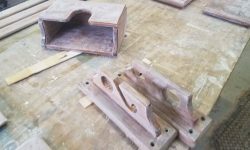 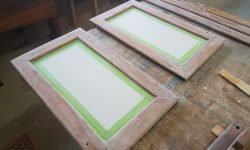 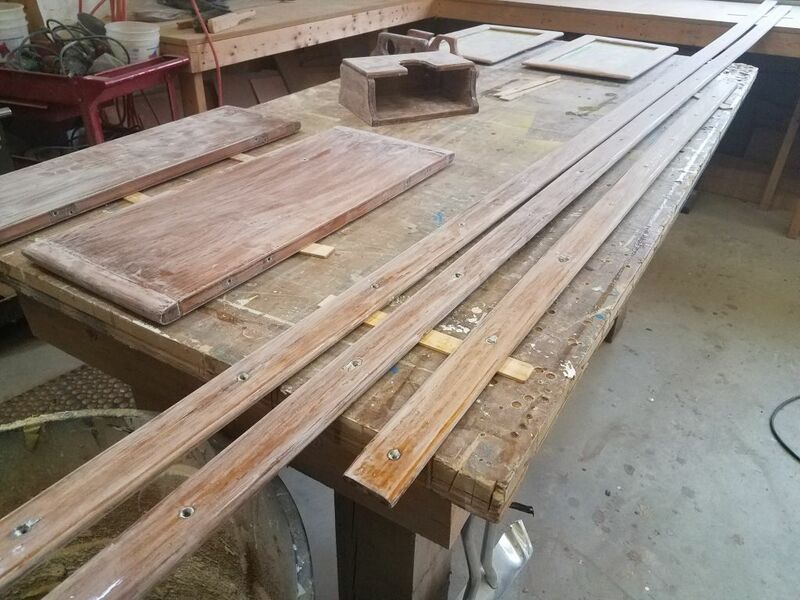 Meanwhile, I lightly sanded the loose trim pieces I’d varnished last time, preparing them for another coat later. 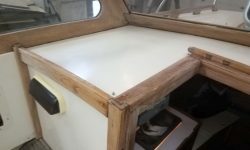 Looking to finish up with dusty work so I could clean up the boat and prepare for the varnish work, I laid out the top of the engine box for its new nonskid. 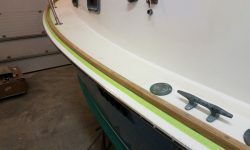 Using dividers, I determined the width of the borders around the nonskid elsewhere in the cockpit, and used this measurement to mark the engine box accordingly. 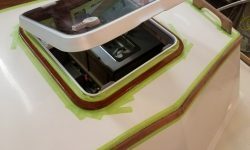 Conveniently, this measurement just cleared a pair of socket mounts in the engine box, keeping them clearly outside of the border. 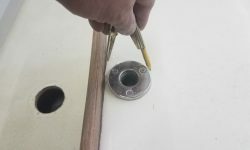 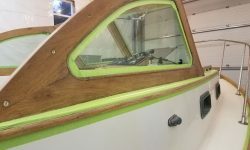 I masked to my marks, and cut a large radius at the corners, again matching the radius I found on other areas in the cockpit. 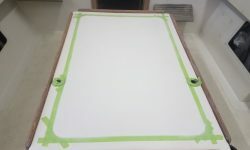 Then, I sanded the field area with 120 grit to prepare for the coatings later. 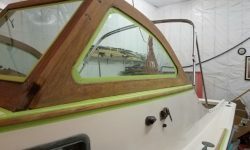 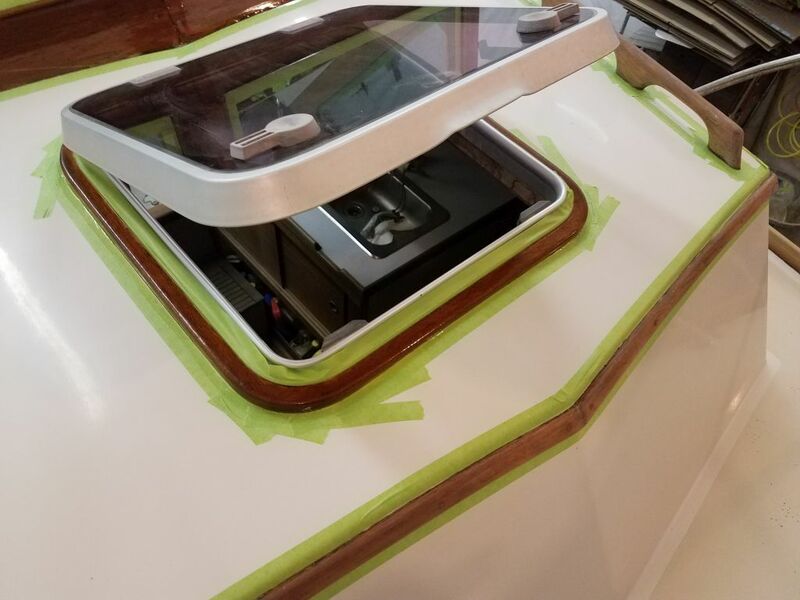 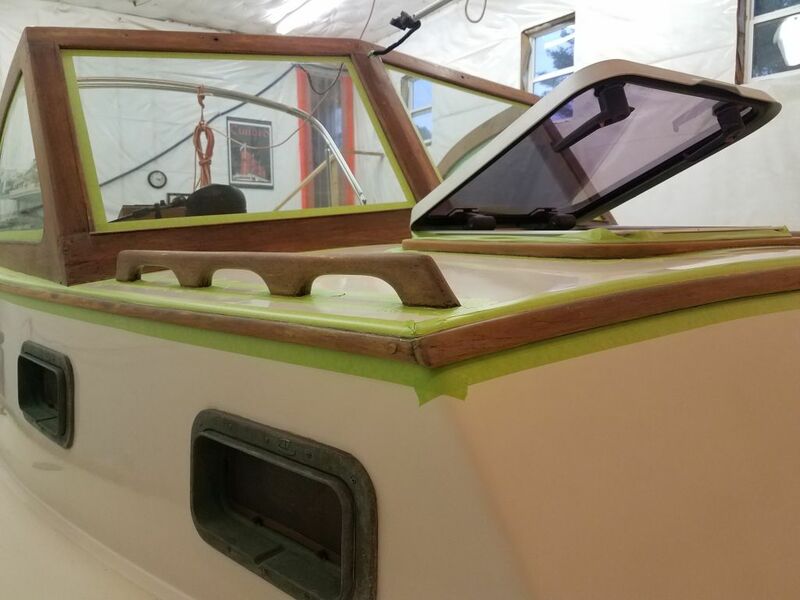 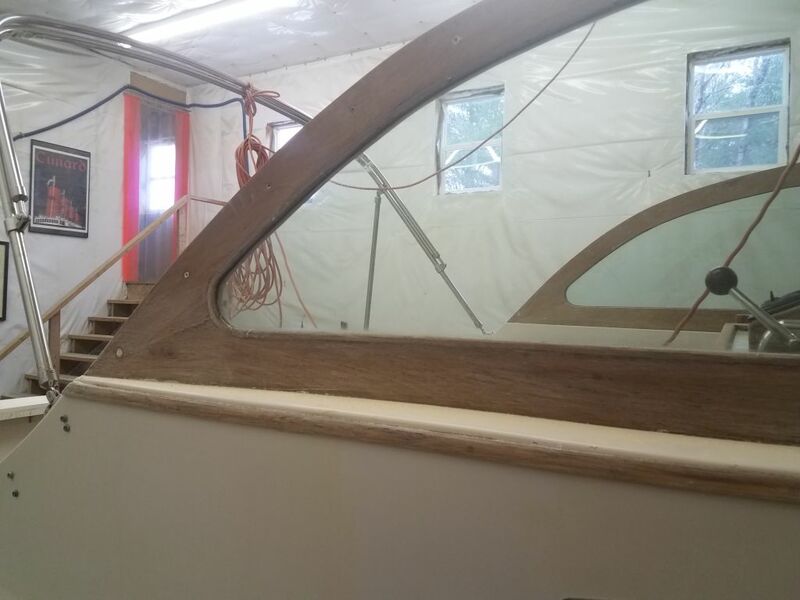 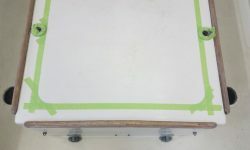 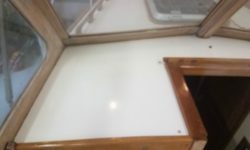 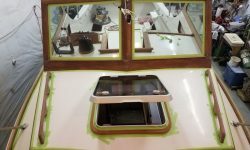 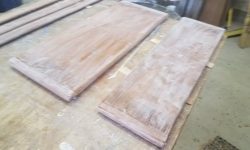 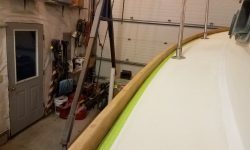 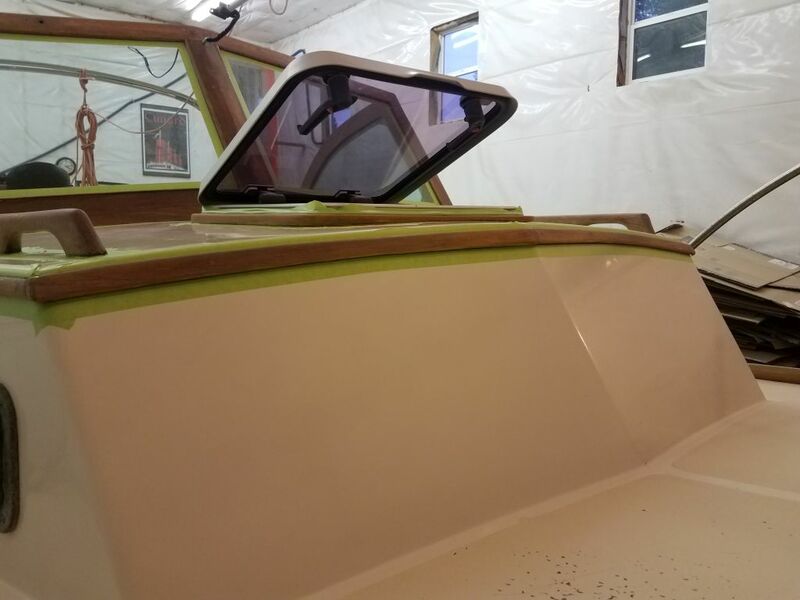 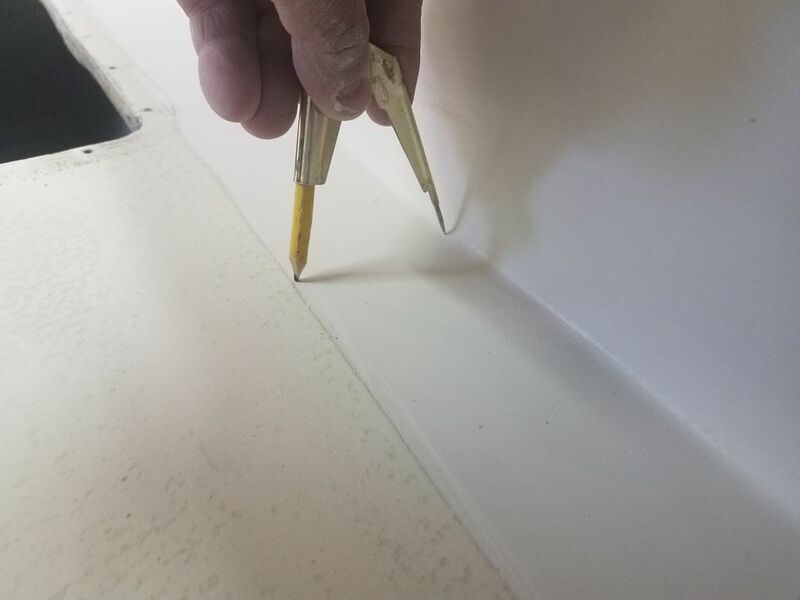 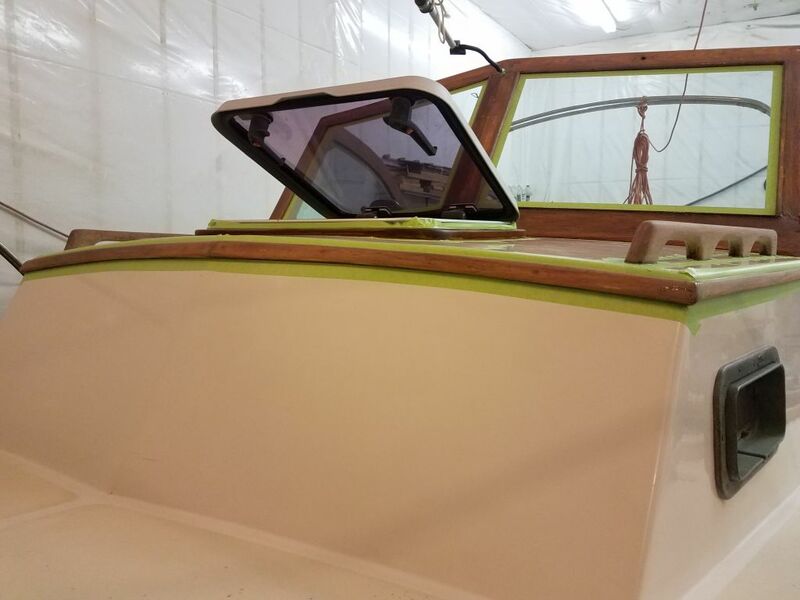 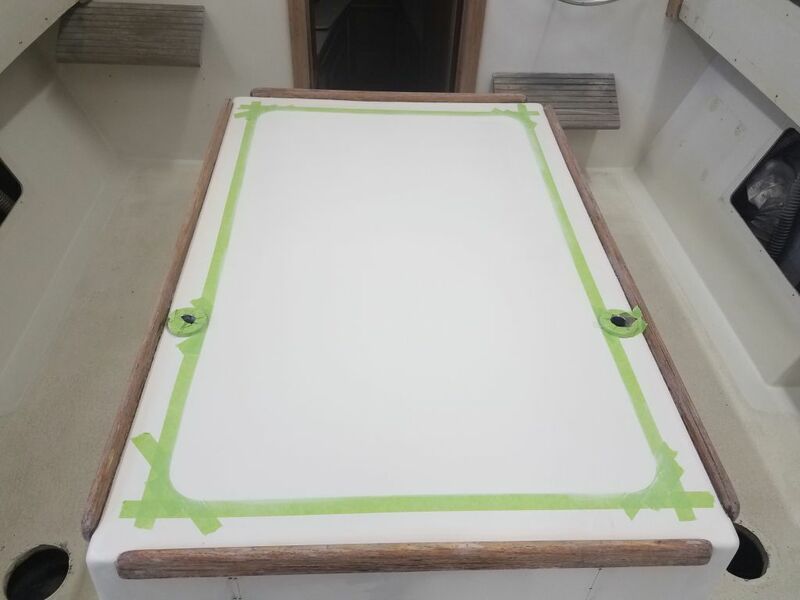 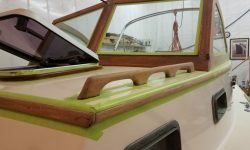 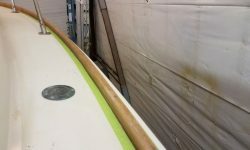 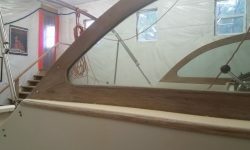 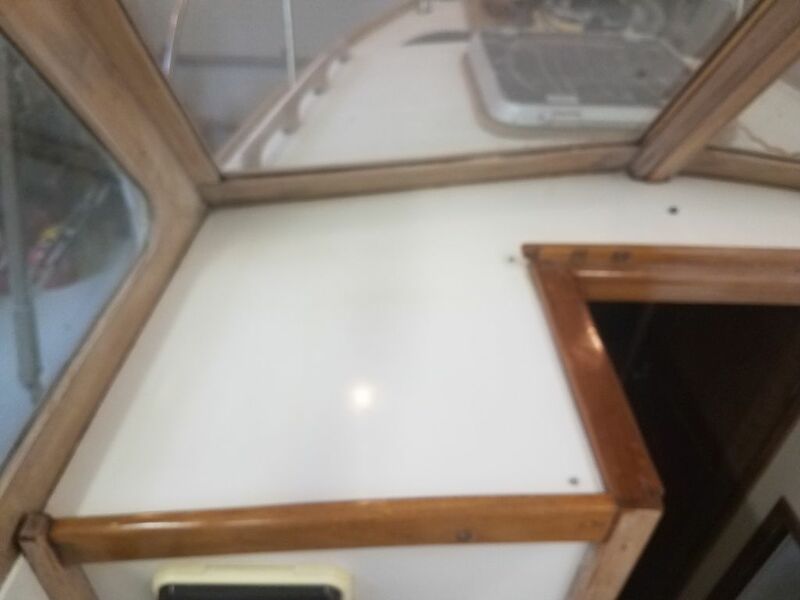 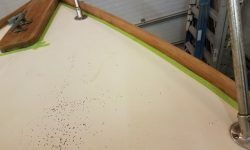 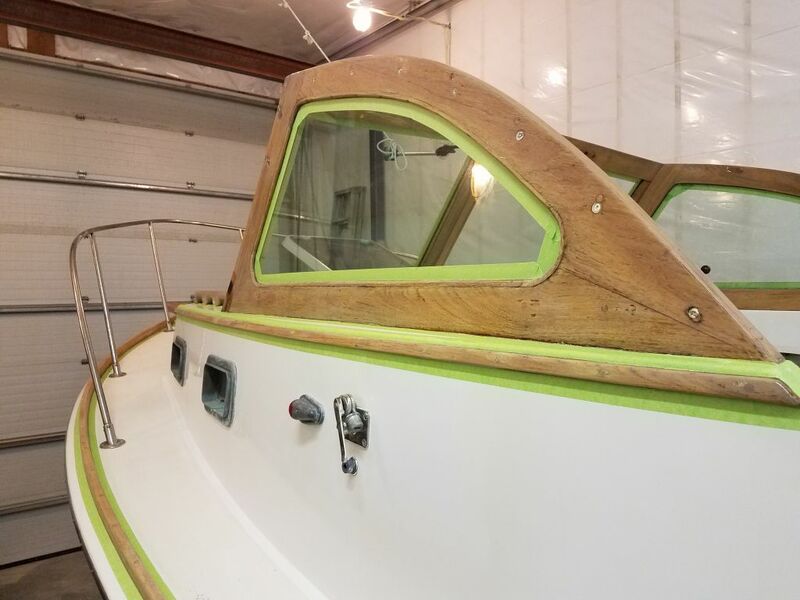 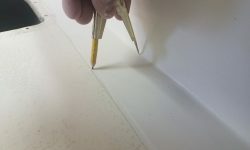 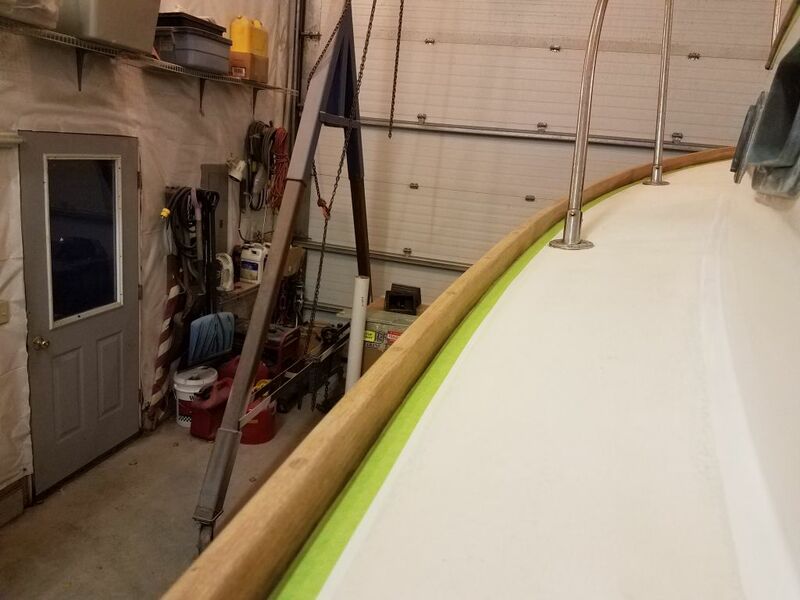 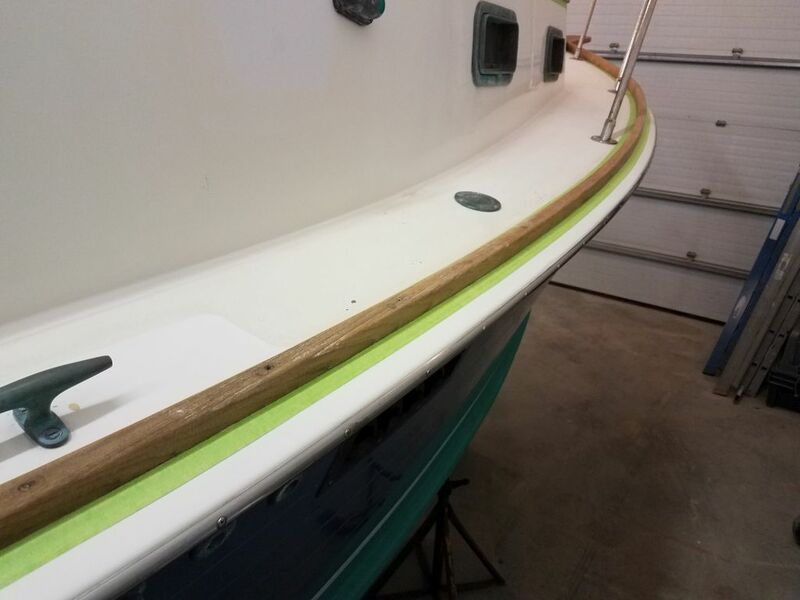 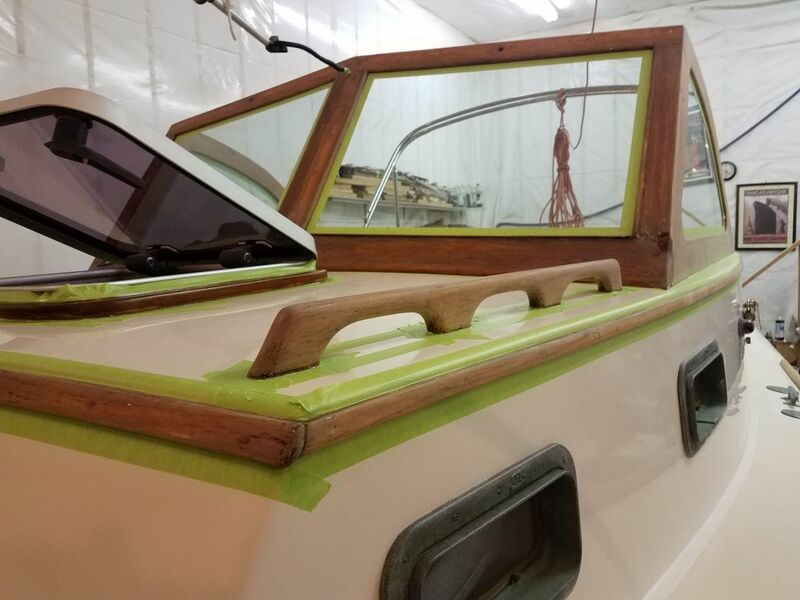 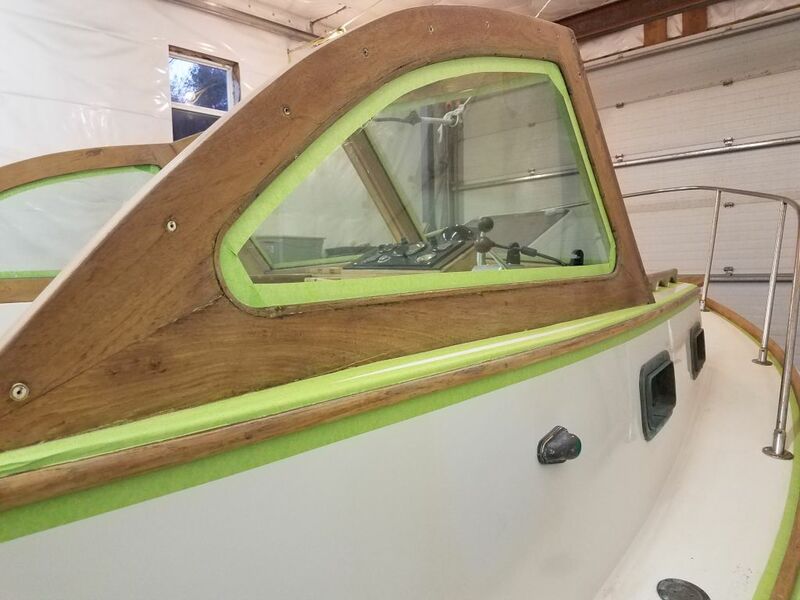 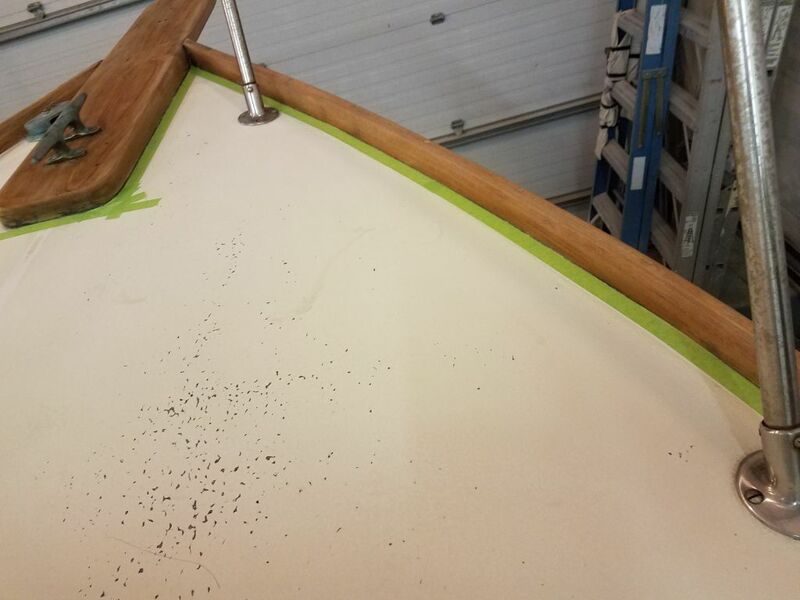 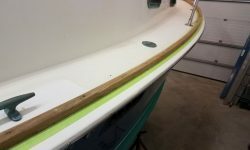 After thoroughly vacuuming and solvent-washing the entire boat, including the decks and brightwork, I was ready to start masking off as needed for the varnish work. 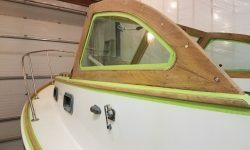 By the end of the day, I’d masked the forward side of the windshield, the eyebrow and handrail trim, the forward hatch, and the toerails. 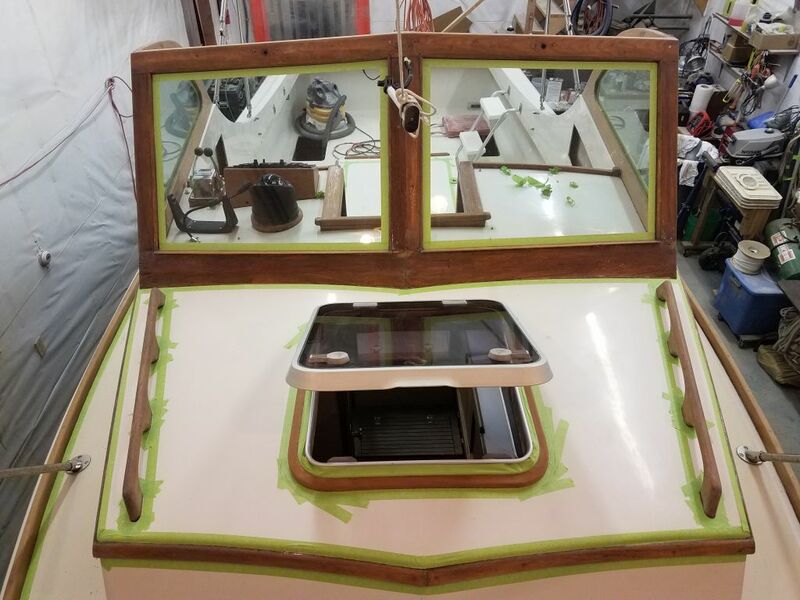 I’d finish up with the inside of the windshield next time, and then I’d be ready to start the maintenance coats of varnish on all areas. 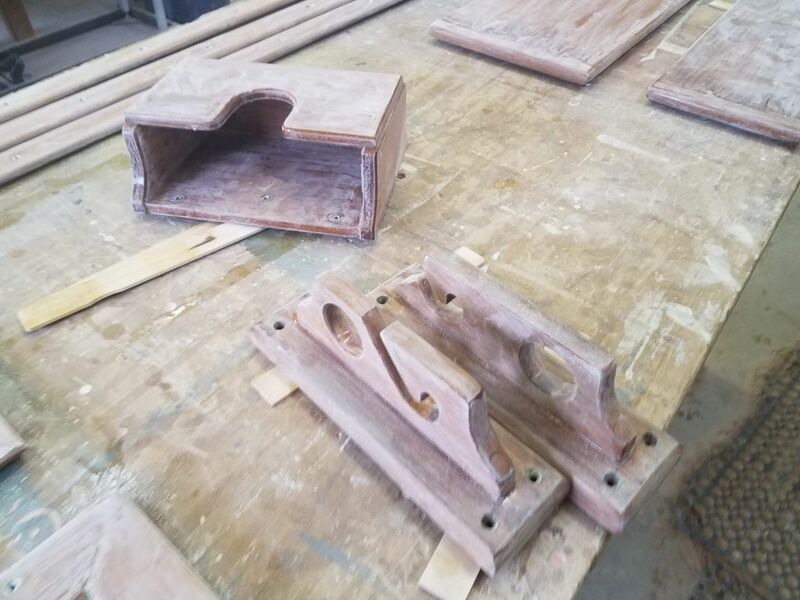 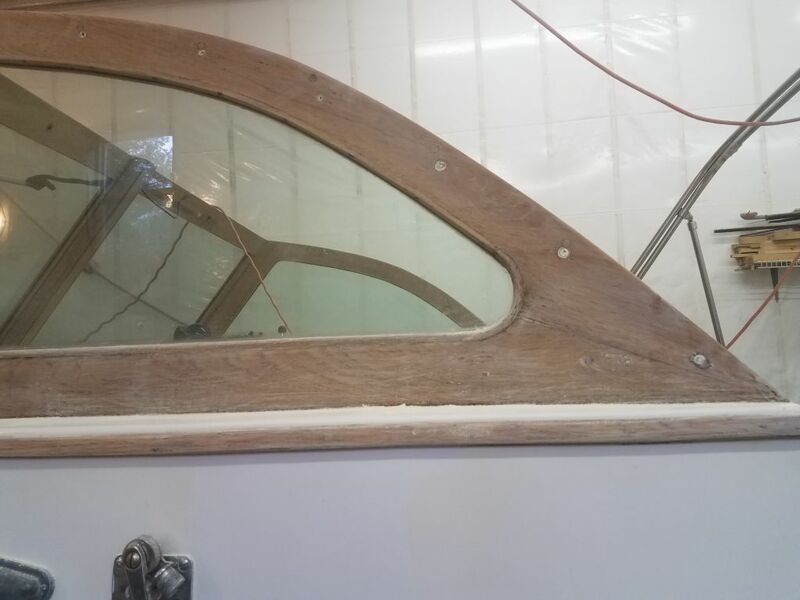 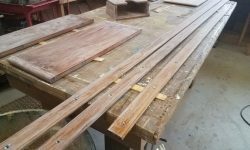 First, though, I applied a thinned coat of sealer varnish to the bare forward hatch frame, and also the little lips at the base of the windshield that I’d stripped earlier.